On Monday, July 28th I had the privilege to attend the Cosmopolitan Summer Fun Event. Guests were able to enjoy refreshing Pinnacle Vodka cocktails, hair chalking by Splat, photo booth, giveaways and more! The ladies and I had a blast! 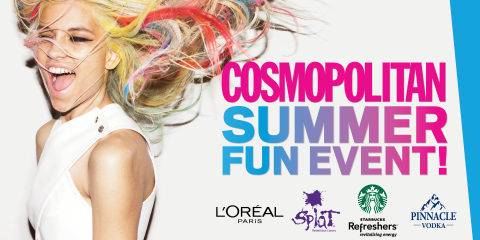 Tags: Cosmo Summer Fun, Cosmopolitan, Hudson Terrace, Loreal, photo booth, Pinnacle Vodka, Splat, Starbucks. Bookmark the permalink.